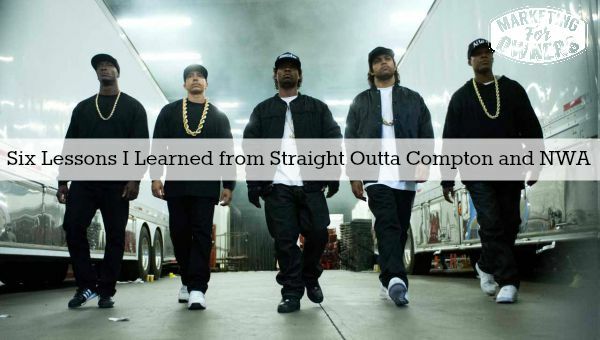 Just having recently seen the movie Straight Outta Compton featuring the NWA guys, it is one of the best movies I’ve seen all year. I recommend you see it. It was also two and a half hours I believe and did not feel like it at all. It’s more of an adult movie so I would be cautious about taking your children because there are one or two swear words. I think there are business lessons to be learned from their experience. These guys are definitely not the way you possibly imagine the power if you don’t know anything about them. Obviously it’s a movie — you don’t have to believe everything but you can certainly believe this. So let’s get started. 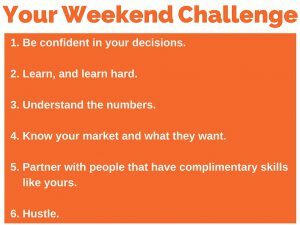 So get your pen and you pad because this is your weekend challenge. No you don’t have to become a rapper. No you don’t have to play an instrument. We’ll be able to sing. This is what I learned and I think you can possibly learn some of the same things from my recommendations. 1. Be confident in your decisions. In other words, trust your gut. These guys started something new. Not only did they start something new, they started something new again and again and again. We all know Dr. Dre ends up with Beats headphones, something new. You might think headphones were around but now are called the sports stuff and the guy sold it for three billion to Apple, most expensive thing Apple has ever bought, I think still to this day. 2. Learn and learn hard. Now this is something that most are guilty of. We’re very envious of other people’s success and we don’t think we can attain the same because they make it look so easy. However, we only ever see the finished product. We never ever see the prototypes and the practice versions. Now again Dr. Dre, he was scratching records in his bedroom. When he got home he was doing that and he was working hard in clubs and he was testing. And he was learning his craft. There’s no school to go to. He had to learn his way. Ice Cube was writing lyrics, writing rhymes, people were laughing at him. He was writing on the bus home. What did you do? What did you do when you’re on the bus home from school or on the bus to school? And when he got there he was writing them and he had a book and he just wrote them over and over and over. So when they started a music career they had a ton of lyrics and of course they got better and better. But you’d think they were good when he started? So you suddenly see them “wow successful.” You wouldn’t have heard of them when they were trying to be successful. It’s the same for us by the way. Spoiler alert they’re going to get ripped off by an agent. Okay most of us in our business avoid finance numbers. I know plenty of people who do and so it’s not surprising. It’s very common. We don’t know. We think we weren’t good at math in school. We don’t get it. We don’t. We pay an accountant. Do not fall for that. You must understand the numbers, understand the numbers and the basics. Get your accountant to explain it in a way that makes sense to you until you do understand. Let me remind you it’s your business, it is your money. Why would you trust anyone else to look after it for you with no accountability, with no understanding? You can be bamboozled as they were and that includes contracts by the way. Someone cans a contract to you again spoiler alert and it’s many, many pages and there’s a deadline and you think you don’t have time to get a lawyer to read it but you think it may be important and you don’t understand. The chances are that they handed it to you late knowing that you will think you haven’t got time to get a lawyer to read it. Get it read by somebody that understands contracts in the music industry especially but it applies to lots. So many people have signed contracts they did not understand and then later on when it hits the fan they say, ‘oh I didn’t realize.” But you’re in, it too late, lesson learned. Don’t learn that lesson the hard way. So it’s worth lawyer for you by the way. 4. Know your market and what they want. Now this most important. It goes with number one with “trust your gut.” The NWA guys, they grew up in Compton. When everyone else was listening too lovely lovely music like I just said the Sugar Hill Gang and all that, they knew what market what the people in Compton, in L.A., the people on the streets wanted because they were there. They were in it, they had a personal understanding and that’s why they succeeded because they provided a music style that everyone else told them would not be successful and today you’ve got people like Jay Z and a ton who have built a business based on what NWA set the path to. Okay, so know your market. 5. Partner with people with complementary skills to yours. Now this is important. Don’t partner with people who are just like you because what are they bringing to the table other than conflict because they’re just like you and eventually you are going to figure they’re not doing it right? Your good at some stuff and you will not get other stuff. Find the people that are good at the other stuff so you can concentrate on the stuff you are good at. Now that doesn’t just mean within your company that can mean with partnering in market. If you want to sell products you can find partners that complement you. So for example, I’m in fire safety so we supply to businesses. I may find someone that is in industrial supplies, industrial cleaning supplies or to name janitorial warehouse supplies things like that. Who don’t sell fire safety stuff but got a similar market. Perhaps we could do a partnership there because we complement each other. Yeah and they did they did the same. They had like Dr Dre did the music, Easy E did the business side of things not bully and did the love the singing . and then you got DJ Yella and Ice Cube who wrote the lyrics, so they all complement each other. Now they did eventually go their own way but they were better as a whole that because I fell out on song. They were better as a whole. You’re may be thinking, it was easy for them. But remember I said you may never see the finished product. When they started playing clubs and bringing new music, how do you think people would get to hear about them if no one had ever heard of that music before? They’re not going to go looking for it. They had to play a little club. They had to hustle. They would stand outside. They would sell cassettes. This was cassettes and records in this day way before C.D.’s. They would sell them at their concerts. They would go to record people and try and push their product. They hustled. They looked for clients one at a time. Later on that became millions and a lot of money as well. But they started with one client as a time, so don’t look at them and say that doesn’t apply. You never hear about them, the early days. People like Ed Sheeran. He slept on floors of friends as he played concerts and played gigs all around the U.K. He couldn’t afford housing, so he slept in his car I believe. He could not afford anything. He hustled. Look at him now. But did you know that? No. So it’s same for you. Hustle, my friend it’s going to work. Anyway, so that’s what I learned from the movie. Go see the movie. You might not look at it in the same way that I do because I’m a marketing person. I love this stuff. 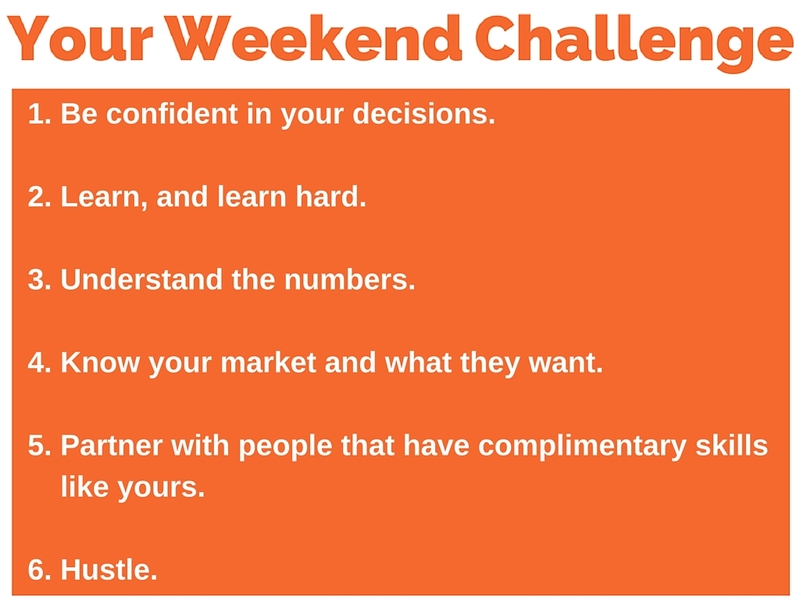 But try that weekend challenge to see if some of that can apply to your business and just think of the way you do things, otherwise, you have yourself a fantastic weekend and I will speak to you on Monday. Which of these 6 is the one you need to work on the most?